I love green beans. I will eat them nearly anyway you make them. As a kid my mom grew them in her garden and I remember endless summer nights on the front porch snapping green beans so she could can them for use in the winter months. It used to be the dreaded job, but we all had to do it and let me tell you that woman grew more green beans than I have ever seen!! As you all know, my husband, the Chinese food master always has us eating it! I always see these green beans on peoples plates, and on buffets, but, I have never tried them. I am not sure why, I mean, I do love green beans, but they always seemed to look questionable to me. I finally sucked it up the other day and tried them. Now, I could go there, and eat only green beans. However, as usual, I needed to add a bit more spice to mine. I don't know how they make them, I have tried swindling other recipes from the waitresses and owner, to absolutely no avail. Back when I was working on General Tso's Chicken, I tried, and that recipe seems to be locked up like Fort Knox. That's fine I say, I will make my own dang green beans. And I did! These are easy and quick. In fact, this recipe is great for 2! You can always just double it for a bigger batch. 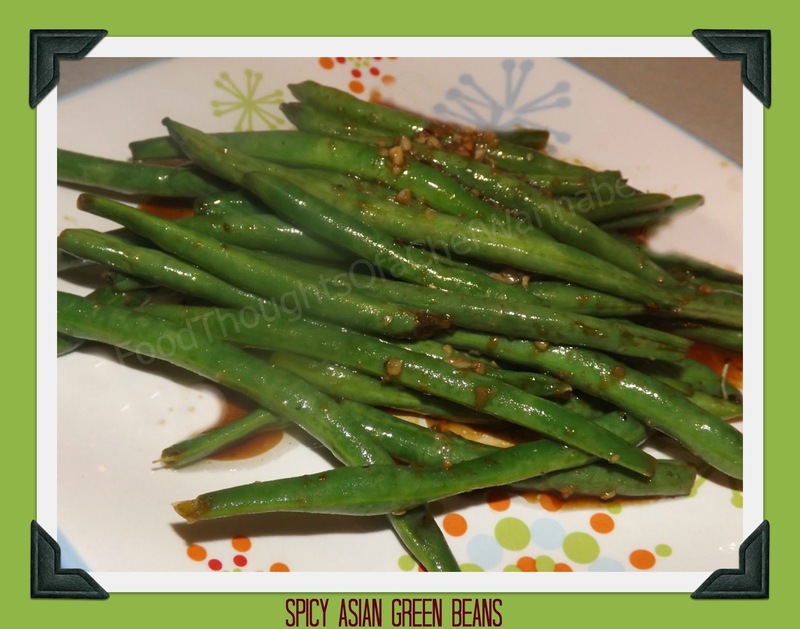 So enjoy this twist on green beans, that I find can sometimes be a bit plain! Snap your green beans, just to get the ends off. You can snap them in half or smaller pieces if you like, I prefer mine long. Rinse them and let them drain while you begin preparing your wok. Heat 2 tsp peanut oil in a wok or high sided skillet. When the oil is hot, add in garlic, and red pepper flakes. Stir constantly, do not stop or the garlic will burn. Stir for 1 minutes and then add in the green beans. Stir fry them for 3-4 minutes, add in water and soy sauce and stir fry another 1-2 minutes. The beans will be crisp tender. This is not for those who enjoy mushy green beans!! They will have a nice crunch but, be tender. You can omit the red pepper flakes if you don't groove on the spice!! I hope you enjoy these delicious green beans!